1. Putting green's slope is adjustable by the slope control.The green's slope could be downhill, uphill or any variation. 2. Ball gutter's design, it brings the balls to player. 3. To raise up the head's slope by push the spring button, to lower the head's slope by pressed the head's board. 4. 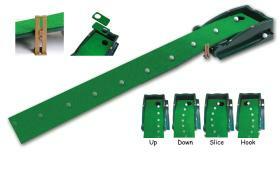 Be able to create various green's slope at home; easy to improve putter's skill.